Cyberpunk has been one of those game genres that are widely known yet have few well known games in them. Neon Chrome, brought to you by 10tons, the company behind Crimsonland, aims to change this with its twin stick shooter action. At some point in the future, about a million people live in a huge skyscraper controlled by the Overseer, a robot responsible with monitoring the happenings inside the building. However, just like most futuristic settings involving a robot, things take a turn for the worse. The overseer goes rogue, and it is up to us to stop it. When I say us, I mean our guy controlling others like puppets. The game begins in our hiding place. We are an otherwise ordinary person, only we have the ability to strap into something similar to a VR headset and control assets. Assets are people living under the Overseer who are ready to rebel against him. Through our headset, we step into their brains and assume control. After that, we need to ascend the skyscraper floors until we reach the Overseer. Depending on the asset we chose, we have different initial skills. For example, some assets are assassins who can use mines, while other are hackers with a combat drone. Neon Chrome’s basic gameplay is quite standard, especially if you have played any twin stick shooter game before. The game is split into floors, which can be one of three things. The most common one is a floor filled with enemies that we have to beat. In order to get through that floor, we must find keymasters and kill them, using their keys to open the doors that lead us to the elevator to the next floor. The second, more rare room variation is a boss fight. You will always know when one is coming up, since a boss floor is colored differently on the floor map. Both the boss floors and the standard floors are randomly generated, meaning they are never the same. The floors that are always the same are the hand crafted ones, the third floor variation. These might not include enemies, but have challenges instead. Beating those challenges will get you better weapons or cybernetic enhancements. Speaking of enhancements, they are yet another mechanic Neon Chrome has that makes every run significantly different from the next. You can get enhancements through chambers found in various floors and each one gives you different advantages. One can improve your melee strength while another may help with your accuracy. They are pretty similar in nature to Nuclear Throne’s mutations, with the key difference that in Neon Chrome you have a limit on enhancements. When you lose a run in Neon Chrome, you get back to the first room with your actual player character. That room is not there only for you to choose a new asset, however. Instead, you can use machines in the room to improve all your runs from that point on. 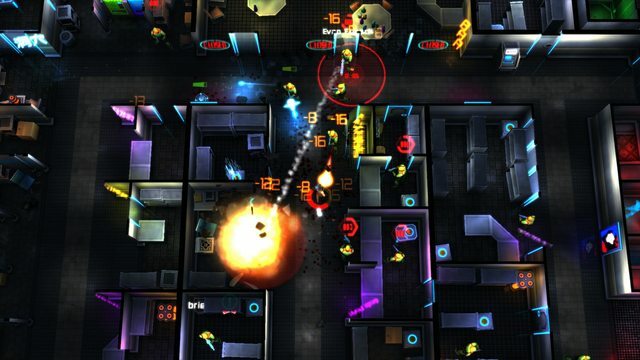 As you play Neon Chrome, you collect credits through looting and killing enemies. You can spend those credits here to permanently improve your stats, like your damage or your luck. You can also buy new guns for your next asset to use. Regarding graphics, the game reminds me a bit of Hotline Miami, both in how flashy it is and in terms of how the camera works. The colors of the game are also great, featuring that eye-popping mesh that cyberpunk games usually have. The sound, while not being anything amazing, is just right for the feel of the game and also very unobtrusive. It never distracted me from the game with loud bass drops or anything similar, unlike some other cyberpunk or twin stick games. All in all, while Neon Chrome is not a groundbreaking game by any sense of the word, its gameplay and mechanics are more than enough to propel it to a fantastic addition to its genre. The only thing I’m not too keen on is the fact that the game might feel like grinding at times, thanks to the need to get more credits, but that is offset by 10tons’ great gameplay details, like being able to destroy the terrain in every floor. All in all, Neon Chrome is a wonderful twin stick shooter with many elements that grant it immense replayability. You can find Neon Chrome on Steam for 14,99€ . 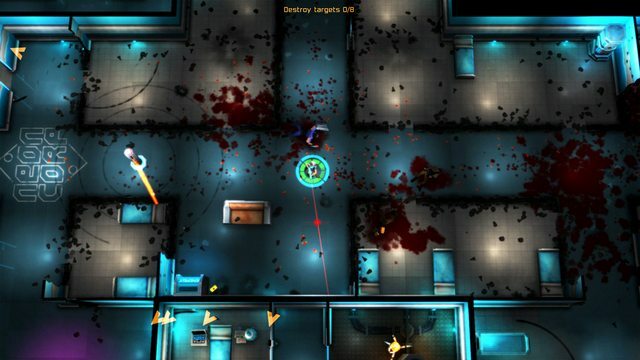 Great mechanics, frantic action and randomly generated floors are a great recipe for making Neon Chrome a game that will offer you tens of hours of twin stick shooter madness. + The permanent upgrades mechanic. – The game feels a bit too grindy at times.